The world’s most outstanding circus lands in Malaga to represent its show “Alegria“. You are still in time to buy your tickets. Place: Malaga city (starting from Estadio Ciudad de Malaga, next to Palacio de Deportes Martin Carpena). This is a very old tradition that commemorates the expulsion of the Moors by the villagers. They exhibit their traditional costumes, dances and gastronomy along the streets of Tolox. Delight your palate in this gastronomic fair where you can taste the rich grape juice of Colmenar and the most popular meat products in the area. If you like gospel, jazz and blues you can miss this outstanding group from the USA, which has a Bronze Star on the Walk of Fame of the Alabama Music Hall. An amazing show of Russian music with an impressive choreography and wonderful costumes. This magical masterpiece tells the story of the young Chun Yi, a beautiful fable that blends Oriental philosophy with ballet and movements of Kung Fu. 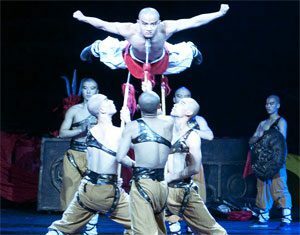 This show became world-renowned in the Beijing Olympics. You will not have trouble finding a good pub or disco in Malaga for the nights of 24 and 31 December. We recommend you to have a stroll near your hotel to find a nice place where to have fun and meet new people. For those who will be in Malaga in December, what are your plans? If you know more interesting events, write a comment and share it with everyone!